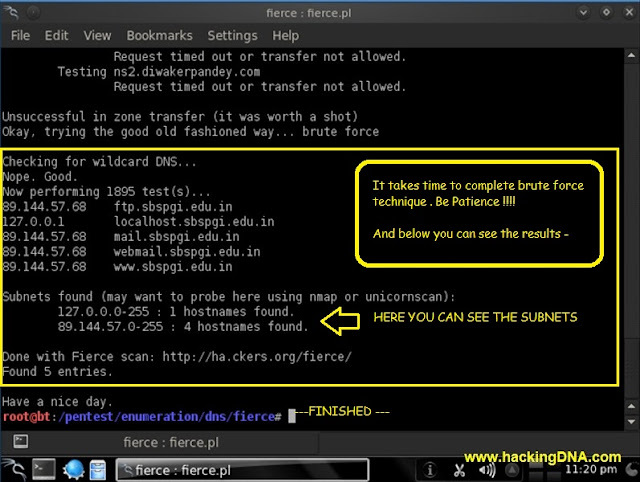 Fierce is a scanning tool that helps you locate ip space and hostname of any target domain. It is written in perl. Fierce scans the victim with Zone Transfer first and if zone transfer is not allowed then it quickly switch to Brute Force technique which takes time but it definately comes out with result . Follow the steps shown in this image to open fierce . EXAMPLE 1 : We have to target a website with proper syntax . Options : - You can check all the options with this command . Here In this example you can see that when i enter the command it shows the DNS Server info but when zone transfer starts it will not allowed . Whenever Zone Transfer is Unsuccessfull it will switch to Brute Force and you can see that it starts checking for wildcard DNS .